A viral video of a man extinguishing his cake’s candles by hand has many of us questioning if we should put an end to the long-time tradition of spitting blowing out our own birthday candles. In the video, the birthday boy calls it the “worst tradition in all of mankind,” and he’s certainly onto something. I don’t know about you, but I’d prefer to have my slice of birthday cake sans germs. When conducting a study on Food Myths in 2012, researchers at Clemson University found there to be a significant increase in bacteria on the cake once the candles had been blown out. Now, while the hand-waving method may have worked for the adult-sized man, it’s hard to imagine it having the same seamless execution by a 3-year toddler. 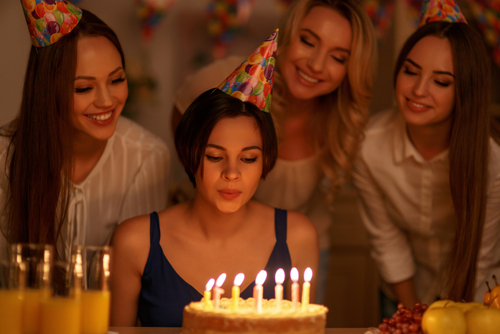 In a Men’s Health’s article, Donna Duberg, (an assistant professor of Clinical Laboratory Science from Saint Louis University) calls our birthday tradition one of the super gross things we do without thinking. Duberg refers to children as “virtual petri-dishes of everything.” This may come off as a little harsh to some, but it’s absolutely true, and co-signed by Charles Gerba, Ph.D., professor of Microbiology and Environmental Sciences at the University of Arizona. “Kids are typically more likely to have colds and flues,” says Gerba. Starting to worry? Don’t. We’ve got a solution for you! If you’re concerned about spreading germs at your toddler’s party, but would like to keep the birthday tradition alive, consider purchasing a separate (and smaller) cake to adorn the candles. Another cool germ-fighting alternative is to serve your guests cupcakes.